If you are looking for a unique and personal wedding gift that will be appreciated and admired for years to come, then you may just have found it. 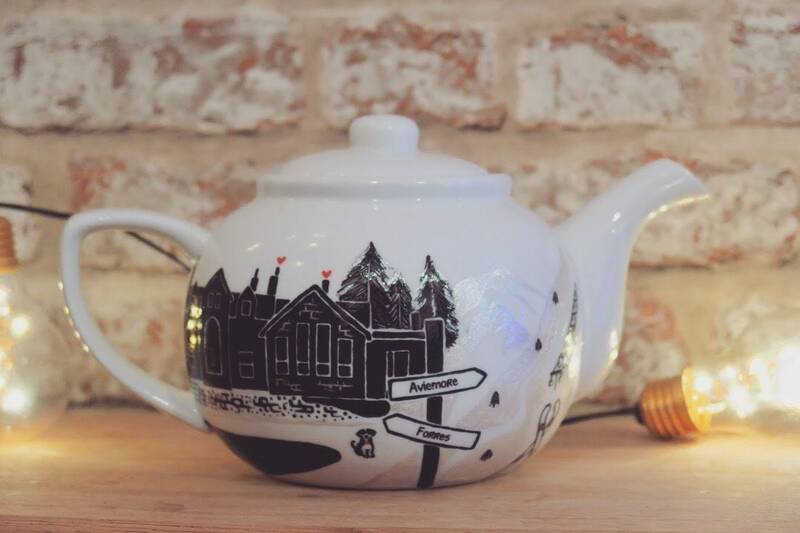 Designed and handpainted, I can customise each individual teapot to your exact specification. A popular choice of theme is the Wedding Venue, which makes for an eye-catching teapot design that the special couple are sure to love. The teapot can be purchased alone, or you can add tea cups to complete the set. I can also incorporate first dance lyrics, quotes, poems or a simple date. Each tea set is painted by hand with the greatest care and attention to detail. The perfect wedding keepsake for a special couple. Many thanks for visiting my shop - any questions, please get in touch! If you would like to place an order or discuss further - click on the 'Request a custom order' option and provide details along with photographs where relevant. This will allow me to provide an exact quote for your requirements. Teapots can take 3-4 weeks, so please allow plenty of time if you would like to order. If you are looking for something at short notice then there may be a possibility it can be prioritised depending on workload. A more accurate delivery timescale will be reflected in the final custom listing that I create for you once we have discussed requirements. The teapots are painted with hard wearing ceramic inks then baked in an oven to ensure they are fully hardened. Although these teapots/teacups are functional, it is advisable that they are for occasional use only as it cannot be guaranteed that they will withstand daily wear and tear. It is often the teapots are purchased for display purposes only to ensure they remain in perfect condition. If the item requires clearning, it is strongly recommended that they are given a gentle hand-wash only - and should not be placed in a dishwasher or exposed to abrasive cleaning products. Brill service, perfect product. As described and exactly what I was after, thanks! Perfect for my Scottish manager! Delivered very quickly, great quality and looks fantastic. Thank you so much! Every item is hand packed and has been carefully quality checked. If, despite our best efforts, we have overlooked a defect of any kind, please let us know. Email info@owlandbrew.com and attach a photograph of the defect along with details of when you purchased it/order no. etc..
We can offer you a replacement, a credit note for our shop or a full refund on the item. We may ask you to return the faulty/defective item to us before we can fulfill a refund, postage costs are not refundable. We deal with returns on a case by case basis, returns are not accepted unless there is good reason or a problem with the purchase that can be reasonably discussed. All orders are subject to the terms & conditions of Owl & Brew. Your order will be posted by Royal Mail Standard Delivery service. If the package is too large to post through your door and you are not at home, you will be left a calling card to pick the package up from your nearest Royal Mail sorting office. I ship orders at 2 or 3 days per week. Shipping days will often be more frequent than this, especially during busy periods when I ship most days. If you require your item urgently please put a note in with your order and I will do my best to accommodate. Please keep in mind that adverse weather conditions can affect delivery times, this is beyond my control. International shipping will be sent using standard Airmail service by Royal Mail. Delivery will vary depending on the destination - this usually varies between 10-20 days.